Think it's tough living with a roommate? These two fellows are sharing a house that spins like a hamster wheel—one on the inside and one on the outside—forcing them to coordinate their daily routine. Ward Shelley and Alex Schweder's In Orbit is a performance art piece examining the social effects of architecture. For ten days, they are spending 24 hours a day in their spinning "house"—although I wonder how the bathroom situation works. 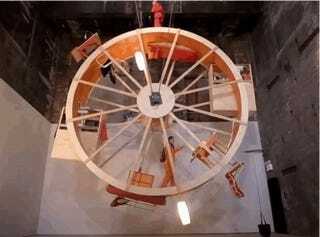 All of the furniture is attached to the wheel itself, and the two have to operate in tandem in order to access a different piece of furniture. The shape of the house affects not just the boundaries but also the relationship between the two dwellers. In Orbit is on display at the Boiler gallery in New York through April 5th, and the pair will be living there full-time through March 9th.